Today in this article I would like advance the script to upload the documents from user’s machine also called remote data upload. Since we can’t get the object of SharePoint site in a PowerShell script I am using the WebClient object. WebClient is one of the way to get the object for a site. The requirement is still remain same as last time that user want to migrate all the documents from his network drive to SharePoint document library as part data migration. Since there are millions of files in user network drive, I can’t ask the user to upload all his files one by one nor with the explorer view. Copying files manually will take quite a good time of time. The below PowerShell script uploads all the user documents to document library. This script I can run request end user to execute on his local machine as and when he / she require. 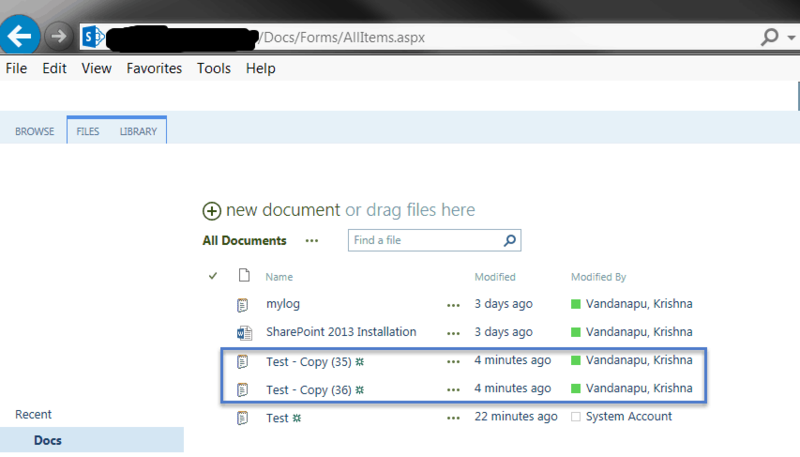 Another way is that I can run on behalf of business user on my machine without doing a remote to SharePoint server. The below line is to associate the user name and password which will be used while creating object to SharePoint site. We are making call to get the object to SharePoint using provided user credentials and WebClient. 4. Execute the script by typing “.\UploadDocuments_With Credentials.ps1” as shown in the below screenshot. 5. This script has will uploaded all the file in “C:\Temp\PS Testing\T” folder as mentioned in the code. In the output you can see the uploaded user name. Note: This script will not work for SharePoint online sites.